Okay, here are the other 2 recipes that I used my Meyer Lemons in. 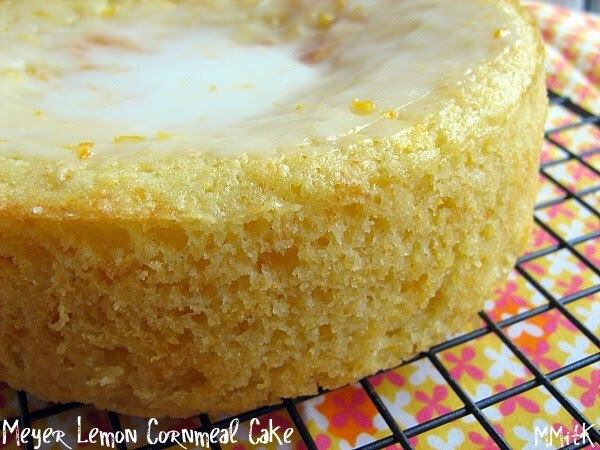 I saw that The Food Librarian made this Lemon Cornmeal Cake with Meyer Lemons and I decided to follow her lead. It was a stir and mix kind of cake with a nice powdered sugar glaze. I didn't make the blueberry sauce because I was trying to keep this sweet and simple. It sure was delicious. I made 1/2 the recipe in a 6-inch pan. My daughters really loved this one. 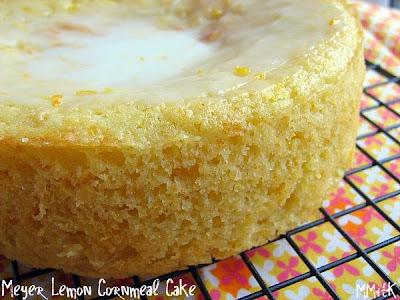 I really enjoy the texture that a little bit of cornmeal adds to a recipe. 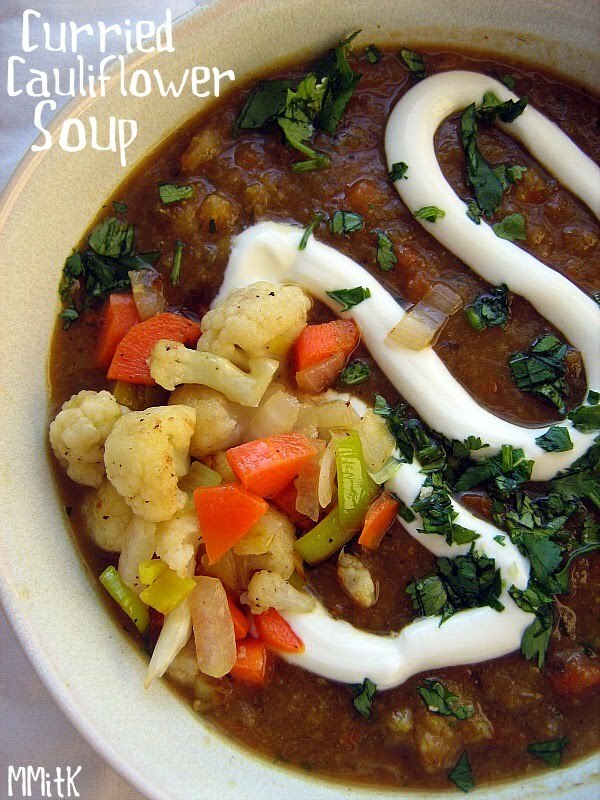 This was simply delightful and one that I want to make again for sure. I don't think I got the glaze thick enough and it pooled in the middle, but that middle section was really citrus-y and delicious. Extra glaze added a bunch of flavor! 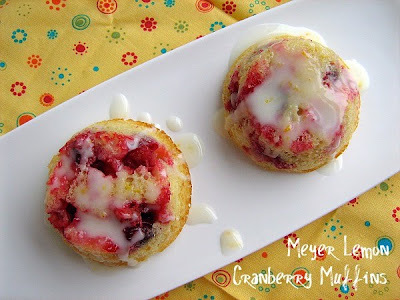 I used the last of my Meyer Lemons to make these Meyer Lemon Cranberry Muffins. I can't remember where I saw this recipe but I always have a stash of frozen cranberries in my freezer, so I figured this was the perfect time to pull them out. This recipe was originally baked in a loaf pan, but I rarely have the patience for a loaf of quick bread. Muffins are easier and quicker. The most interesting thing about this recipe is that the wet ingredients are mostly Meyer lemon juice. 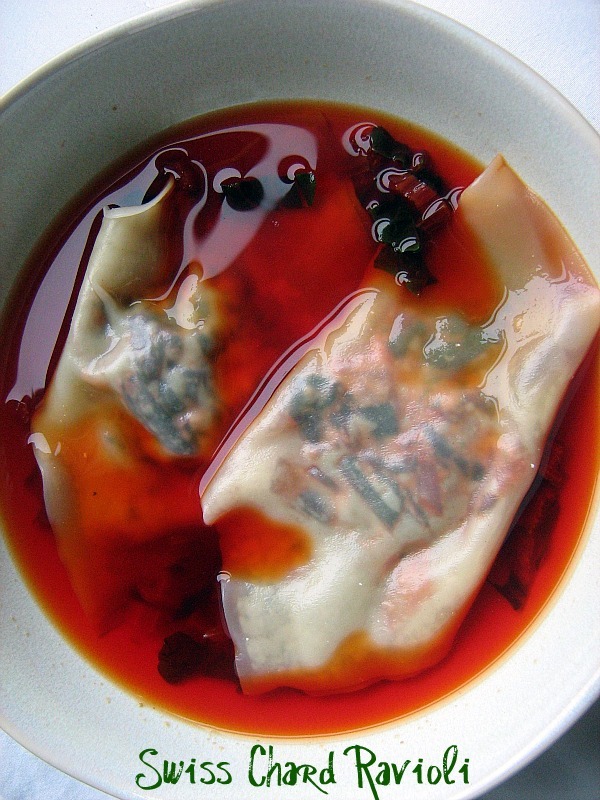 There is an egg and a little bit of oil, but for the most part, lemon juice does the job. As you can imagine, that gives this muffins a really bright, lemon-y flavor. Very lemon-y and citrus-y and just tart enough with that lovely edge of sweet that the Meyer lemon has. The cranberries sunk the bottom of the muffin tin, so when I turned them out of the pan, I left them upside down. I added some of the leftover glaze from the cornmeal cake above, but for some reason I think these were better without the glaze. That my friends, is the end of my Meyer Lemon extravanganza for this year. I hope I find them again next year and I can experiment even more. 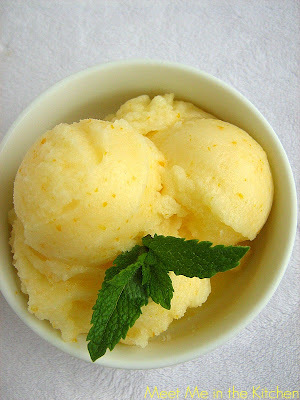 I still had some Meyer Lemons to use so I decided to try out a sorbet. 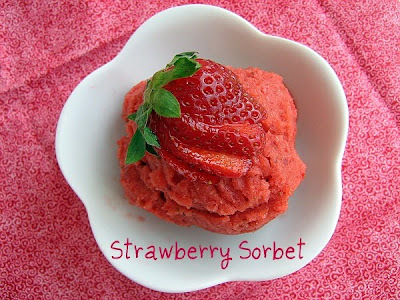 I have been really interested in sorbets lately, but I am not sure why. They just taste so pure and fruity. This sorbet is no exception. The flavor of Meyer Lemons is hard to explain. They definitely are a lemon but there are hints of mandarin or tangerine that really mellow the tartness. I find the flavor absolutely delightful. I'm wondering why it has taken me so long to discover this tasty citrus. Sorbet is so light and just a few spoonfuls can really satisfy you. Speaking of a few spoonfuls- I think I will head to the freezer and have a few! Meyer Lemon Coffee Cake (via martha stewart) when my brother was here, but I ran out of time. I had already purchased the 10 Meyer lemons though, so I needed a new plan. I have never tasted a Meyer Lemon or seen one until a couple of weeks ago when they appeared in my local Publix. I had seen lots of recipes that used them, so I was excited that they were finally available to me. 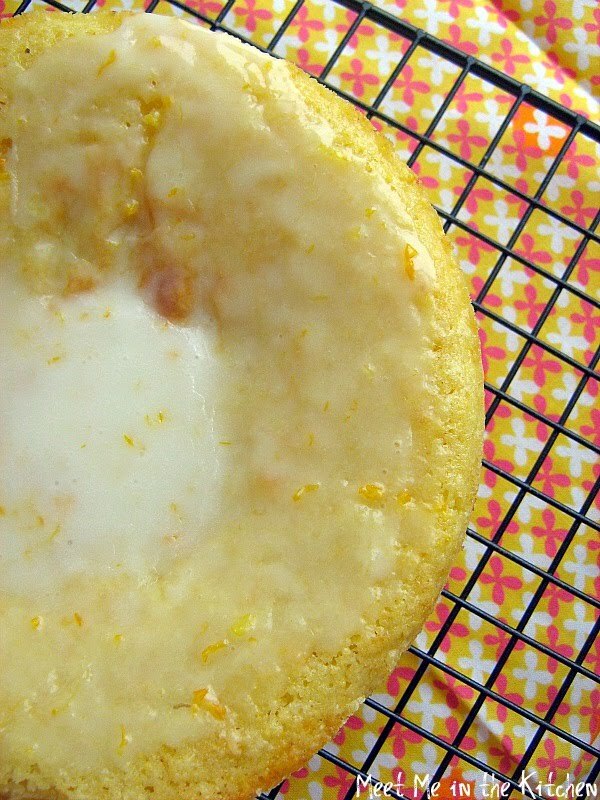 I couldn't choose just one thing to make with my Meyer lemons, but the first thing I wanted to try was this Meyer Lemon Upside-Down Cake. The site where I found this recipe says this about Meyer lemons- "It's easy to understand what botanical explorer Frank Meyer saw in the cheery citrus fruit he found in China in 1908. Thought to be a cross between mandarins and lemons, Meyer lemons (as they've come to be known) have a thin, smooth skin and an alluring fragrance. But the biggest draw is their taste -- wonderfully sweet with very little pucker." I made 1/2 of the recipe in a 6-inch cake pan. You rub some softened butter in the pan, sprinkle brown sugar on top and then arrange thin slices of Meyer lemon on top of the sugar. The batter is made from ground almonds, eggs, and honey. The egg whites are beaten and then folded into the egg yolk/honey/ground almond mixture. The resulting cake is very good. Tender, but not to sweet with the delicious topping of almost candied Meyer lemons on top. 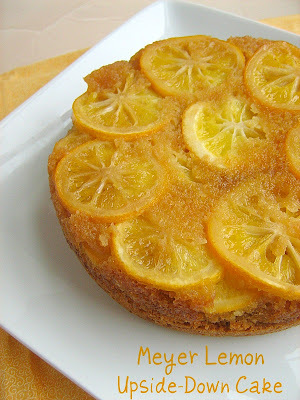 If you can get your hands on some Meyer lemons, I highly recommend making this delicious little cake. This is from a couple of months ago, but it seemed like a good thing to post now that spring is here. I had some Gougeres formed and frozen in my freezer and needed to find a good filling. I made these for a get-together where there were appetizers from all over the world. 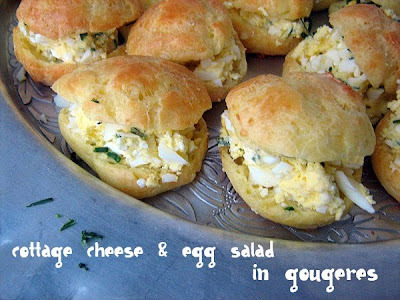 Since I lived in Estonia for 18 months, I made a Estonian twist on egg salad. The recipe is in grams, but I just used my kitchen scale to get the right amount of butter and cottage cheese. These would be great for a party or spring themed shower. Here is a quick recipe before the weekend starts. I saw this in a recent issue of Everyday with Rachael Ray magazine. It was in the Dinners for less than 10 dollars section and had lots of dark greens, including swiss chard and spinach, so I knew it would be a quick weeknight meal for us. It has a little bit of flour cooked into the sauteed veggies, which thickens the whole dish and gives it a risotto-like texture. I changed the recipe quite a bit, because I couldn't find escarole anywhere and had quick cooking barley on hand. It was fast and easy and very filling. Mine turned kinda reddish/pink because I used red chard, but it was still delicious. My younger brother is here visiting with us for a couple of days and I am grateful it is going to be such a beautiful weekend. 1. In a dutch oven or large pot, heat the oil over medium-high heat. Add the celery, onion, and green pepper and cook, stirring occasionally, until softened, about 5 minutes; season with salt and pepper. 2. Add the flour and cook, stirring often, about 5 minutes. Add the swiss chard stems and cook for 1 minute. Stir in the barley, vegetable stock and 1 cup water; bring to a boil. Lower the heat, cover and simmer until the barley is just tender, about 10-12 minutes. 3. 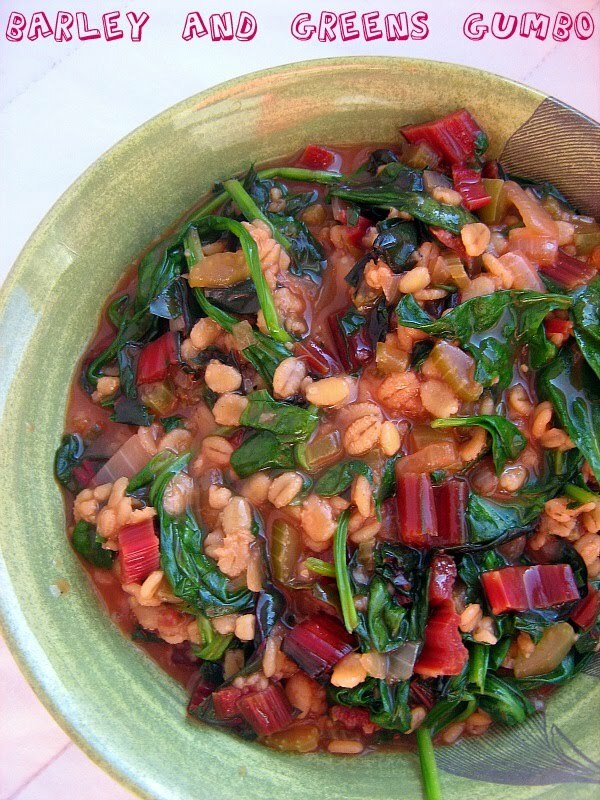 Working in batches, add the swiss chard, spinach and parsley, stirring the greens until wilted between each addition. Season with salt and pepper. When we were in Miami, we walked through the Lincoln Road Mall at least once a day. There are so many fun shops, restaurants, art galleries, etc. there. I had to go in Williams-Sonoma one day, just to look around. Side note- did you know that Williams-Sonoma is now selling grains and lentils and stuff like that? I was so excited when I saw quinoa, red lentils and even black lentils in stock there. Anyway, I started talking to the woman working there and she told me about this soup. She had made it the day before during a cooking demonstration and also at home, so I took the recipe card and decided to make it when I got home. We kept talking and talking and then I noticed my husband had left his spot outside the store where he was watching people, so I had to run out and try to find him! Spring has officially arrived here in Georgia- we've got gorgeous weather, lots of pollen and my roses are blooming! Every once in awhile we still have a rainy day and I made this last week on a very rainy day. It was perfect. Since I added the spices and herbs to the soup it isn't the most pleasant color to look at, but we tried to spiff it up with some of the yogurt and cilantro garnish. I didn't follow the recipe exactly- I made few changes, like I usually do and they are noted below. Have you ever been to the Lincoln Road Mall? Do you love Williams-Sonoma? 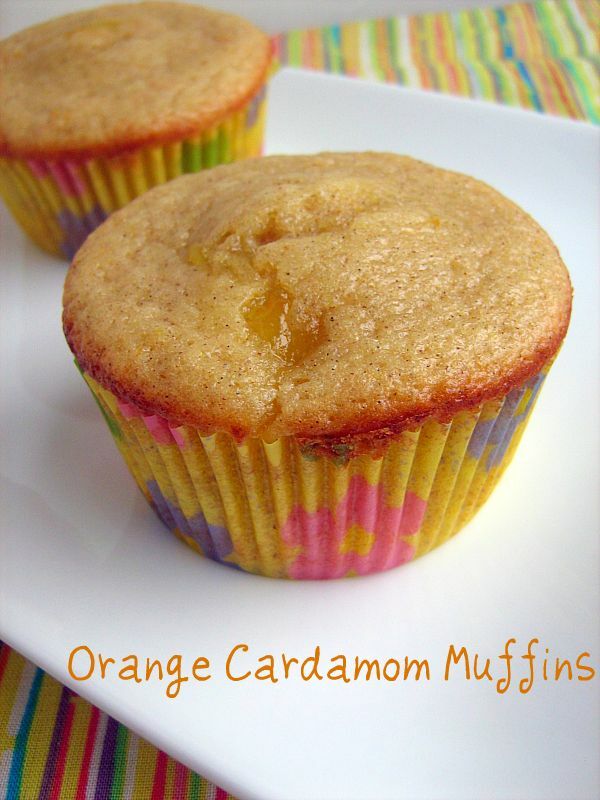 This year for our St. Patrick's Day treat, we are doing something light and fruity. It also just happens to be naturally green. 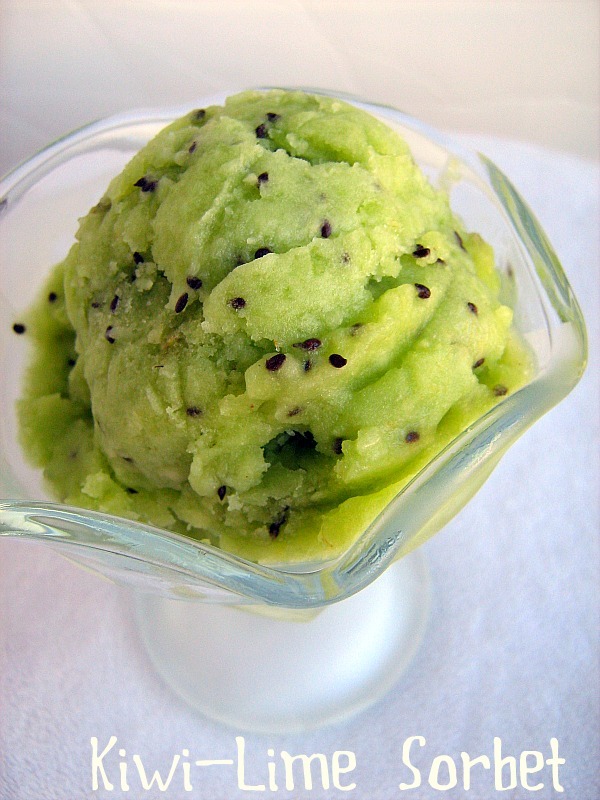 It is a super fast and easy Kiwi sorbet that has the addition of limeade concentrate to bump up the flavor a little bit. 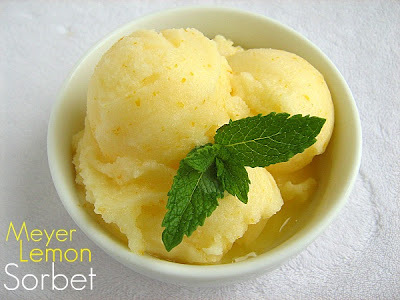 This sorbet is soo easy. All you do is peel the kiwi into the bowl of a food processor or blender, add a little limeade concentrate, and a few Tablespoons of sugar. I added the sugar gradually, so that I could make sure it wasn't too sweet. I recommend adding a little sugar at a time, then blending the ingredients and tasting it, so that you get the level of sweetness you want. Freeze the puree in your ice cream maker and a few hours later you have a lovely green treat. My kids are about to get off the bus and this is going to be a fun after school treat. Happy St. Patrick's Day everyone! * I did not add all the sugar at once- I added 2 Tablespoons and pureed it in the food processor and then tasted it. I added another Tablespoon, pureed and tasted. I ended up adding 4-5 Tablespoons of sugar. We always celebrate this day with as many green foods as possible. Last year we made the best Mint Chocolate Chip Ice Cream ever, these Mint Chocolate Cupcakes are always popular, and every year that I can remember we have had some form of green eggs and ham (last year it was a biscuit sandwich). This year I am trying to stay away from the green food coloring as much as I can, (although I will use it to make our eggs green this morning), and we are going to enjoy green foods that are really green because they grow that way. This is the perfect one to start off the green food celebration. This is a simple way to serve asparagus. 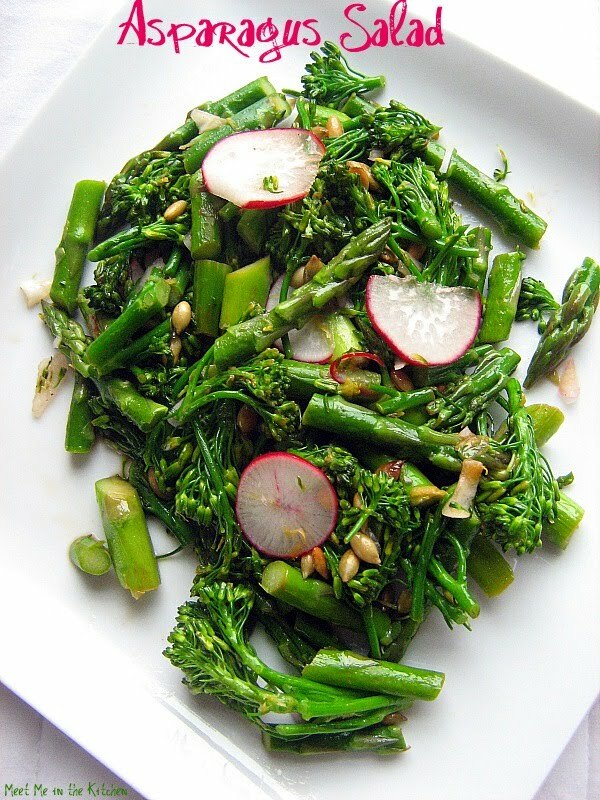 It is briefly cooked, along with broccolini, for about 2-3 minutes, so it is crisp tender. Then it is tossed with a lemon juice-olive oil-shallot dressing, and topped with pepitas, thinly sliced radishes and lemon zest. If you can think of anything more delicious or perfect, please feel free to suggest it, because this was pretty amazing. It's interesting how something so quick and easy can truly be so flavorful and delightful to eat. Last night I all of the sudden got excited about making some St. Patrick's day food. One of the things that I really love is Soda Bread. 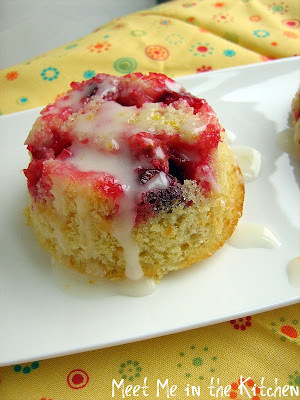 I have made it before, but never with a recipe that calls for currants and mostly white flour. 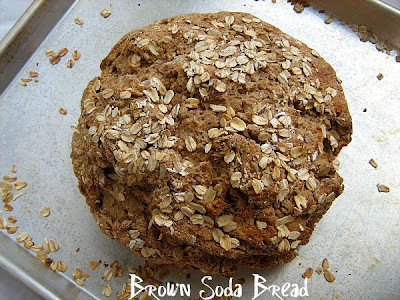 I love Brown Soda bread that is full of yummy grains and oats and is not sweet. It is hearty and delicious. Plus, it is so easy to make-kind of like biscuits, but you don't have to cut out shapes. All you do is mix the dry ingredients together, cut in a small amount of butter and then stir in the buttermilk until the dough forms. I decided to make a round loaf out of my dough, because it looks more exciting than a plain loaf of bread. My daughter and I sliced a piece of this bread as soon as it came out of the oven and it is absolutely perfect. I love the color, flavor and delicious health-y taste of this yummy bread. When I was a child, we would go to my grandparents house on the weekends. The first thing we would do on Saturday morning was head out to the garden to pick the produce. I remember going out before the sun was all the way up and hoping that my job would be picking strawberries. They were close to the ground, so it was easy to kneel and go through the strawberry plants and find all the red, ripe berries. It was so much better than having to go into the raspberry patch! Most of the time, we got to pick both. There isn't much better than a fresh picked strawberry. Juicy, flavorful and delicious. Strawberries are coming into season and we have been consuming quite a few of these yummy berries. My kids can easily eat a pound or two in an afternoon, so when I buy strawberries, I know they won't last very long. 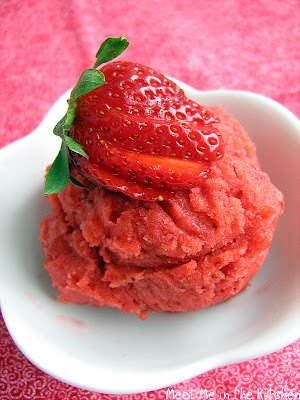 I wanted to make this simple sorbet to bring out the beautiful color and flavor of strawberries right now. It was really simple to make, just a few steps involved. I made a few substitutions, mostly because I happened to be out of lemons. Next time I would reduce the sugar by about 1/4 or 1/3 cup- this time I reduced it by a couple of tablespoons. I prefer fruit desserts to be less sweet and more about the natural flavor of the fruit. This makes me excited about spring! Slice the strawberries and toss them in a medium bowl with the sugar and kirsch, if using, stirring until the sugar begins to dissolve (I just sliced my strawberries right into the food processor, so I wouldn't have to move them). Cover and let stand for 1 hour, stirring every so often. So many things are going on in life right now. We have had a 24 hour stomach bug that is making it's way through our family. The third child had it this morning and had to be checked out of school. Fun times all around! Cross your fingers that it skips over the parents! Anyway, I wanted to share this salad really quickly. This was something that I saw on epicurious and I thought it was so cute because they served it in little mason jars. 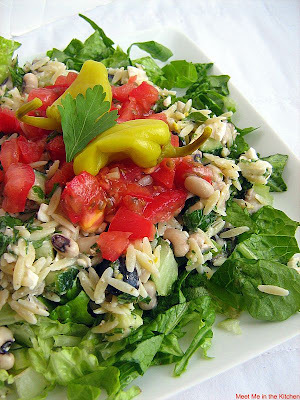 Greek salad is a serious favorite around here and I loved this take with black-eyed peas. I made a couple of changes to the recipe which are noted below. This salad turned out really great. The first night I served it on top of romaine. There were enough leftovers that a few nights later I mixed in a can of tuna and a little more lemon juice and we were able to eat it again. Very good. I have to say that the peperoncini really made this delicious. They are definitely becoming a favorite of mine. About 6 weeks ago I made this Elegant Citrus Tart, when we had people over for dessert and pictures just didn't happen. I had leftover Buttery Orange Curd, which was the filling for the tart, and I was trying to figure out what to do with it. I have swirled leftover curd into ice cream and breakfast cakes/muffins before, so I knew that a muffin would be a good choice. I made these back in January, when I was doing my month without using butter, so I had to find a recipe that used oil or buttermilk. 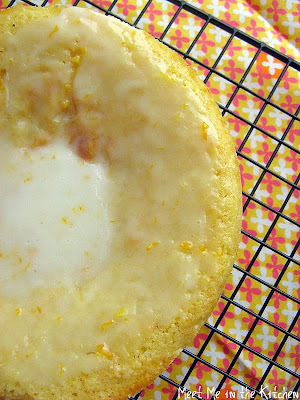 I found a Orange Cardamom Cake on myrecipes and knew it would be perfect. I made 1/3 of the batter and made muffins. I filled the muffin liners about halfway with batter and then dropped in a Tablespoon of the orange curd. Then I put a couple more Tablespoons of batter on top and swirled in a little curd on top. The muffins baked up in about18-21 minutes and they tasted amazing warm. 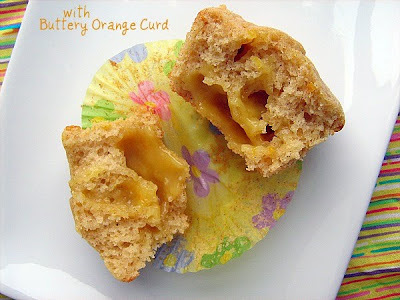 All the orange curd had sunk to the bottom, but it made for an amazing breakfast treat. I had a great weekend in Miami- thanks for all the well wishes! Today, my husband and I are celebrating our 10th anniversary. In a couple of hours, we are flying to Miami for a long weekend. I am so very excited! I will be celebrating by basking in the sun, on the beach for a few days, so I thought I would share a cake with you today and celebrate here as well. 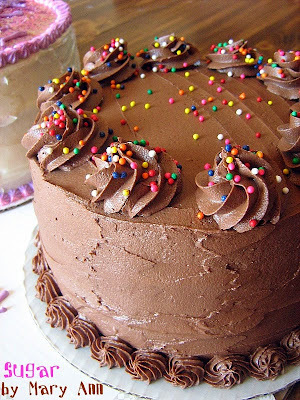 I shared these pictures on my sugar blog , which is where I share all the goodies that I am baking up for people these days, but when I tasted a little crumb of this cake and a dab of the leftover frosting, I figured someone out there might need to bake it up for themselves. Have a great weekend everyone! 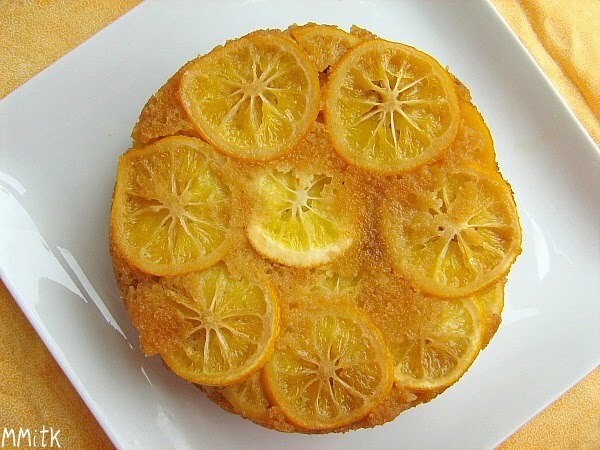 This month's Cooking Light Virtual Supper Club's theme was Notes of Citrus, which was chosen by Jamie. I love citrus and the beautiful flavor it can give to any dish, savory or sweet. I chose to make a dip this time around, which was very quick and easy to throw together. My life has been so extremely busy the past couple of weeks, so this was the perfect thing for a superfast, after-school snack. Now, unfortunately for me, I didn' t realize the picture was so bad until I started editing photos late last night. SO, I apologize for how this dip looks. 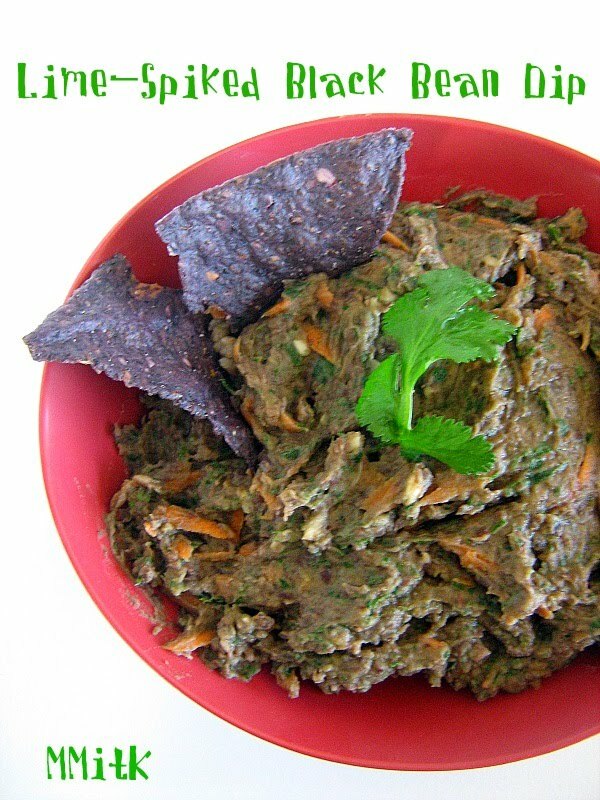 Keep in mind that it is pureed black beans and go over to Cooking Light to see a better picture of this dip. It has to be the angle. Oh well, moving on- the dip was delicious and only contained a few ingredients. I went ahead and pureed the cilantro, garlic and green onions in with the black beans, which made this even easier. I found some organic blue corn tortilla chips that we dipped in it, but cucumber slices, and carrot sticks were also really tasty. This would also be a really great spread for a sandwich or wrap. Check out what the other members of the Supper Club chose to contribute below and go see how the other citrus-y parts of this menu turned out!